At the start of this week, the worst case scenario for Italy in Europe was Napoli squandering their two goal advantage against Chelsea, Inter unable to overcome an eminently achievable goal of eliminating Marseille, and Udinese ultimately succumbing to a 2-0 defeat inflicted by AZ Alkmaar in the Europa League. It all happened--and then some. On Thursday night, Italy had a sole representative in the quarter-final of European competition left and that was Milan, the club that has often carried Italy in Europe in the past. A season that could have seen Italy gather valuable coefficient points now hinges on Milan. "This has been the trend for many years," mused Milan vice-president Adriano Galliani. "France and Portugal will surpass us soon in the rankings." The this he refers to darkly is Italy's unfailing ability to find the ceiling fan and noose around this time in Europe. Perhaps Galliani a bit too pessimistic, but as I have written before what his melancholy predicts is not implausible. Portugal have now two teams left in European competition: Sporting Lisbon and Benfica. The former have a great opportunity to go deep in the Europa League as they have been handed Metalist Kharkiv as quarter-final opponents, while the latter have to overcome Chelsea in the Champions League. Portugal may well amass more points than Italy this season. It all now depends on Milan. But even then there is a slight problem. The Rossoneri have come up against that team from Catalonia. Milan are not only up against Pep Guardiola and his team, but also a sizeable portion of public opinion, manufactured fans, and an overwhelming feeling of inevitability that the Allianz Arena should, by divine right, by the right of what is right, host Real Madrid and Barcelona in the Final. 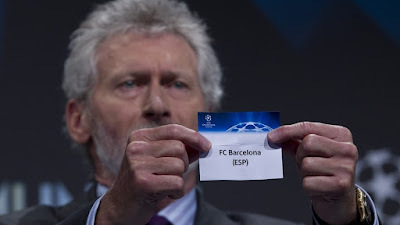 "For me, the winner of this competition must stop Messi and his friends," said former Bayern Munich and Real Madrid legend Paul Breitner before he would draw out the names for the Champions League quarter-finals. Obvious, yes. Ominous, too. Each time the bearded German opened the tiny plastic ball to reveal a team, my heart drummed. There were seven possible teams for Milan. After drawing Barcelona in the group stage, and Arsenal in the second round, surely Milan deserved better. The uncaring probability of things didn't think so. Clinically, it only left one option behind, and for Milan it was possibly the worst. The incubo, or the nightmare, had thrown up a phantasmagoria all week: Brandao's off-the-back goal in the dying seconds against Inter, Bransilav Ivanovic's thumping shot in the roof of the net against Napoli, and Erik Falkenburg's improbable goal against Udinese. Breitner contributed another traumatic image. "I am looking at the positives," said Allegri in the aftermath of the draw. "We beat Barcelona, and then it will be easier to get into the Final." Fair enough, with all due respect to Chelsea and Benfica. 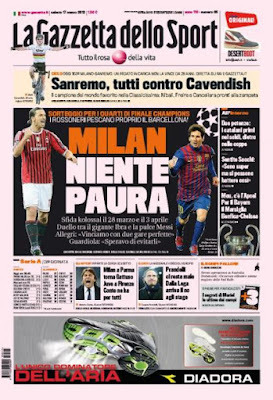 Milan's pink paper La Gazzetto dello Sport reinforced the coach with a daring title of "Milan, niente paura," or "Milan, no fear." If ever there was a time for bravado, false or genuine, this is it. Milan fans would never enjoy taking the same route as their despised rivals Inter to success. However, at this stage they wouldn't mind if events conspired similarly to 2010: a volcanic eruption in Iceland that caused Barca to arrive at the San Siro tired and lose 3-1, a 1-0 loss at the Camp Nou that was characterized by a monumental hang-on job, and of course the sprinkler treatment. From potential conflagration to being drenched in victory's water, that Inter-Barcelona tie proved that the elements can indeed conspire in a Barcelona loss. But Milan can also take heart from their own exploits at the Camp Nou this season when they came home with a 2-2 draw during the group stage. Even allowing for the fact that they were second best for most of the game, that score would nonetheless suit them immensely in the quarter-final. Even the 3-2 loss in the return showed that Milan can indeed hurt Barcelona. Of course, the key for Milan is to make sure Thiago Silva, Kevin-Prince Boateng, and Zlatan Ibrahimovic are healthy for the encounter. Mark van Bommel is instrumental to a game like this, but he is suspended for the first leg, depleting an already vulnerable midfield. However, if Milan can keep a clean sheet at home in the first-leg, there is a decent chance for them to progress. Indeed, Silvio Berlusconi is immodestly confident: "We are not afraid of Barcelona or Messi, and we know how to handle them." Many have said it. Few have done it. 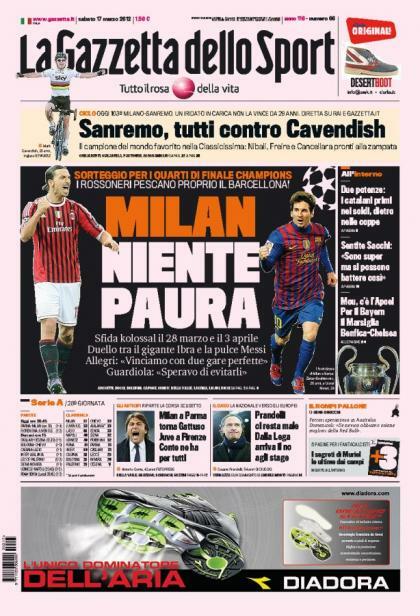 Milan must give it their entirety on March 28th and April 3rd--for themselves and Italy. always a nice read: complimenti!